The University of Houston C. T. Bauer College of Business and the Greater Houston Partnership announced today a ranking for the college’s entrepreneurship program that is indicative of the city’s strength in growing businesses and creating jobs. For the third time in five years, the Cyvia and Melvyn Wolff Center at UH Bauer has been ranked the best of its kind in the nation, landing at the top of The Princeton Review’s list of leading undergraduate entrepreneurship programs in the U.S. for Entrepreneur magazine. The program again is No. 1 on the list of the Top 25 Undergraduate Schools for Entrepreneurs, released by The Princeton Review and Entrepreneur on Sept. 20. The program was ranked No. 1 in 2008 and 2010, and No. 2 in 2007 and 2009. Wolff Center students helped to celebrate the ranking of the entrepreneurship program at the GHP offices. “As a business school, we are proud to be home to the No. 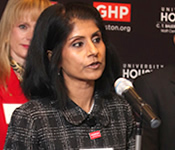 1 undergraduate entrepreneurship program in the country,” Bauer College Dean Latha Ramchand said. Ranking second and third on the list are Babson College and Baylor University, respectively. The entrepreneurship program at UH Bauer also tops Syracuse University, the University of Southern California, the University of Arizona and 19 others on the list. The ranking for the city’s business school is the latest of several national recognitions of the Houston job market and economy. The Kauffman Foundation ranked Houston as one of the nation’s leading cities in terms of entrepreneurial activity in 2010, out of the 15 largest U.S. cities. Despite an economic downturn and record unemployment, entrepreneurial activity nationwide has risen in the past year, according to the Kauffman Index of Entrepreneurial Activity, with 565,000 new businesses created each month in the United States in 2010. 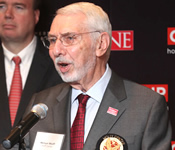 Bauer College has been educating business leaders for decades, with the Wolff Center for Entrepreneurship cementing the school’s status as a leader in entrepreneurship when it was created in 1993. The Commission for Higher Education approved entrepreneurship as a major in 1995. Since then, the program has flourished and developed courses for entrepreneurship majors as well as business minors, now attracting more than 1,800 students a semester. The program has also gained respect from members of the Houston community, who mentor students in the program. Longstanding and highly respected Houstonians Cyvia and Melvyn Wolff became the namesakes of the program in 2008. Wolff is a 1953 graduate of Bauer College, a member of the Dean’s Executive Board and chairman of the board for Star Furniture, a Berkshire-Hathaway company. 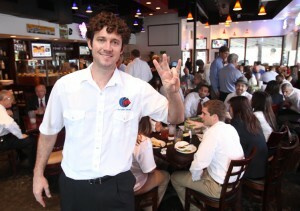 Following the official announcement, the celebration continued with a lunch at BB’s Café in the Heights, owned by Brooks Bassler, a 2002 alumnus of the entrepreneurship program. Before 2007, Bauer’s entrepreneurship program was recognized regionally. The recent national rankings are indicative of the tremendous growth and breadth of the program, which educates business students as well as those from other disciplines through its global business minor, Ramchand said. “The education you receive at the Wolff Center focuses on creating an entrepreneurial mindset and process that is applicable to any major at Bauer and students across the university. Faculty teaching in the program are experienced entrepreneurs, all of whom have landed, bought or successfully run their own businesses. About 40 percent of students involved in the entrepreneurship program are not business majors, and 53 percent of undergraduate students at Bauer participate in the program,” she added. The ranking also validates the world-class education Bauer students receive through the Wolff Center’s entrepreneurship program, its global business minor and its corporate entrepreneurship certification program, she added. Bauer College offers its entrepreneurship students a complete and comprehensive program that includes a six-course lockstep program as well as several enrichment activities to supplement the academic instruction. Each year, between 30 and 35 students are selected through a rigorous application process to take the Wolff Center’s major program in entrepreneurship. In addition, the WCE certification program in corporate entrepreneurship is the foundation of the college’s global business minor for non-business students. Nearly 1,000 non-business students take WCE courses each year and have an opportunity to see how entrepreneurial thinking can be applied to their interests in engineering, science, social science or the arts. Each year, an average of 65 percent of WCE students started a business while in school or shortly after graduating. Others go on to join existing ventures and to apply the entrepreneurial lessons learned at UH Bauer to innovate and expand those businesses. WCE students have also won numerous awards in national business plan competitions — even outperforming MBA teams from other schools including Carnegie Mellon. Students in Bauer’s executive MBA program have also had the opportunity to take elective courses in entrepreneurship and corporate entrepreneurship. The Princeton Review determined the rankings of both graduate and undergraduate programs by evaluating key criteria in the areas of academics and requirements, students and faculty, and outside-the-classroom support and experiences from more than 2,000 programs that were surveyed. For more information and a complete listing of the schools included on the list, go to www.entrepreneur.com/topcolleges. Full details will also appear in the October issue of Entrepreneur available on newsstands today. 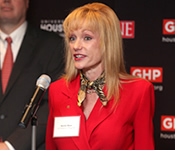 “It’s tremendous to have a college that is as successful as the C. T. Bauer College of Business right here in our very own backyard helping us cultivate this important talent that is necessary for Houston to grow as a top 10 global community,” Jeff Moseley, President and CEO of the Greater Houston Partnership said. 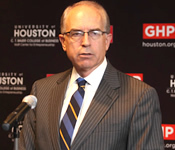 “This announcement is just one more piece of evidence of the work that the University of Houston is doing,” Larry Kellner, Chair of the Greater Houston Partnership said. 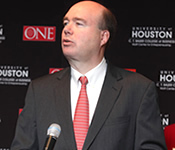 “The University of Houston is one of the jewels of the crown of the city of Houston. If you want to grab on to a shooting star, grab on to the coat tails of the University of Houston because we’re going places,” Nelda Blair, Chair of the UH System Board of Regents said. 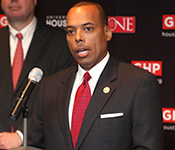 “It is no secret to anyone that Houston is a great place to do business — to start a small business, to work collaboratively with business partners, to expand globally,” said City Controller Ronald C. Green. “We call on the business community to guest lecture, to serve on advisory boards, and sometimes to hire our graduates, and we’re never disappointed. We have lots of stories that we can tell of students running successful businesses, thanks to their time here at Bauer,” said Melvyn Wolff, Chair of Star Furniture board of directors.